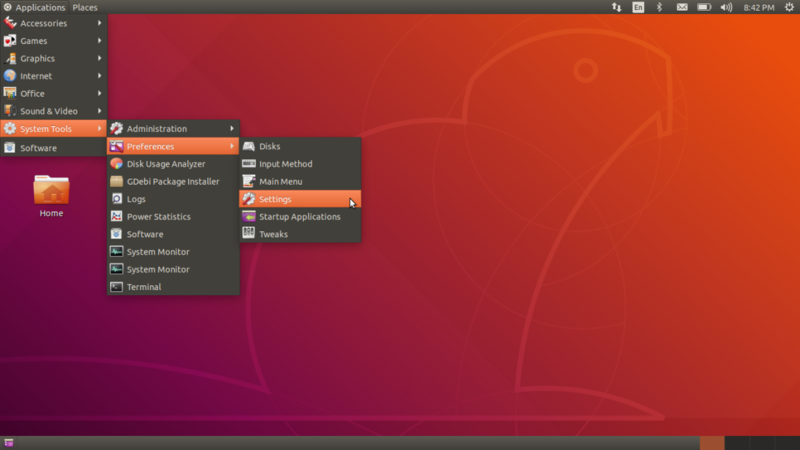 The Gnome X11 environment comes with a system called Panel. Gnome panels are bars where the system include menus, icons, the date, statistics, etc. So I right clicked and selected the option properties. That gave me the Panel Properties window. In that window you have the option Autohide. 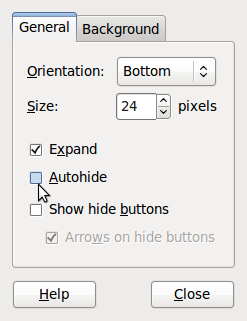 That option means that the panel and its contents are not shown at all unless you move the mouse in that area. At that time, the panel pops out and you can use it. Neat feature, I guess, except that (1) it locked up my two panels; and (2) when you have both top and bottom panel at the bottom, it just doesn't work right. Somehow, one of the panels prevents the other from being used correctly. Of course, I ran in the problem after I made the selection and got stuck there. I'm not too sure why they added a % character, but oh well..
And change the value from "true" to "false". This can be done from any editor... so?! How do you start that editor? In my case I had a terminal, but if you don't have one and cannot just do a Ctrl+Alt-F12 to get out of X11, then you'll want to create a Launcher. When clicking on the desktop with the right mouse button anywhere on the background, you get a menu that includes Create Launcher. Select that option and in the window that appears, enter whatever you want in Name and gnome-terminal. This creates a new icon on your desktop that you can click to start an X terminal. Today I did an upgrade (apt-get upgrade) and for the first time lost something in gnome. Such a problem had not happened for ages, so it was quite a surprise. That did happen to me too, although the path is different from what others were saying it should look like. I looked a little closer and noticed that the folder was given root:root as user:group. That means the Gnome system cannot access the data. I guess that the installation scripts generated that problem. I changed the ownership to myself and everything is not working just fine again. In other forums they say to just delete the folder. I think that deleting, if not required, would eventually re-generate the same issue on another update. Using the chown it makes it mine and it still exists so it won't be re-created and cause problems. Here I specify the version since things are actually changing and they are changing fast. It is not unlikely that this won't apply to 11.10. This entry tells the Gnome server to start the application as shown in the Exec variable. Most everything shown here should be selfexplanatory otherwise. As you can see the file says "Written by GNOME Terminal" and a version. I use the gnome-session-save function to save this data, which then is saved in the session that doesn't get loaded on startup. You can also just reuse my copy here and tweak it as you go. Since 14.04, I had to change the way my terminals are opened in my X11 session. Each time I start X11, I like to have 6 terminals opened in Gnome xterm. These need to open in a specific folder and each year I like to change it because one of the folder is year specific. As you can see, I have a new script called terminals. This script includes the command used to start the terminal with 6 tabs, each with a different working directory. I inadvertendly removed various packages and one of them apparently was the bottom panel which I therefore lost. Oops.